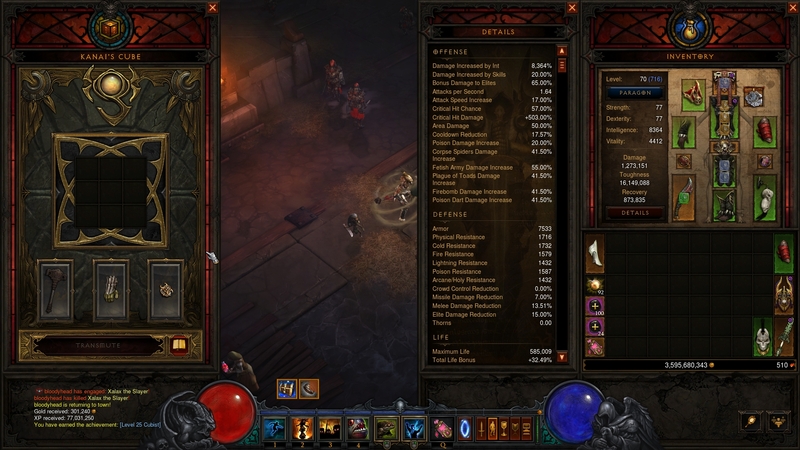 This article talks about the Zunimassa Pet Build and a few variations for patch 2.3 The main build has been tested on PTR for Torment 6 and I will be looking when I have more free time to push this build both for Greater Rifts and higher Torments. Most Zunimassa Pet builds go with a 5 piece Zunimassa set with the legs, feet, chest, hands and mojo and add a Ring of Royal Grandeur to get the basic bonus along with using the Mask of Jeram for the pet damage boost. In addition, we use the 3 piece bonus of Aughilds through the shoulder and bracer set pieces for some damage reduction and elite damage bonus. From there, it really depends on the gear you manage to acquire. In my build, I use the Belt of Transcendence for summoning fetishes to replace my Fetish Sycophant passive. In turn, I can pick up another passive such as Jungle Fortitude for a little extra toughness. I do lose out to some attack speed and critical hit damage, but reasoning for picking up this belt is near 100% uptime on you fetishes. Since the 6 piece bonus increases your damage with a spender for your pets by 4%, the belt works out nicely in terms of granting this uptime with your fetishes along with the damage buff. Another really helpful item, if you can manage to find it, is the Starmetal Kukri. Even a poorly rolled one is worth using mostly because of how it allows you to keep Big Bad Voodoo up most of the time, giving you a 30% damage increase almost all the time. For your ring, you can choose a Convention of Elements for the poison or physical burst damage or a Zunimassas Pox. If you take the Zunimassa’s Pox ring, you can swap out your gloves for Tasker and Theo. That provides up to a 50% increase in attack speed for your fetishes, which will be incredibly important if you manage to stumble across a Starmetal Kukri. Ideally, for your neck slot, you should farm up a well rolled Hellfire Amulet or an immunity amulet. For myself, I would try to go for a passive like Fierce Loyalty based on my current passives. Right now, I’m using Gruesome Feast for the health globe mana/intelligence boost, Pierce the Veil (for extra damage), Grave Injustice for cooldown reduction and life/manage regeneration and Jungle Fortitude for the damage reduction. Fierce Loyalty would be a nice addition just for the boost in movement speed. With patch 2.3, you will be able to gain three more passives through your legendaries. The three I ended up choosing for this build are The Furnace, Tasker and Theo and Obsidian Ring of the Zodiac. Right now, I do not have a Hellfire Amulet for my witch doctor so I do not have an additional passive. However, I ended up choosing these three passives for very high cooldown reduction, fast movement and extremely aggressive kill speeds. Using Tasker and Theo as my passive grants me maximum attack speed for my pets at a 50% increase. You want your fetishes to be hitting fast and often as that will quickly reduce the cooldown on Big Bad Voodoo via your Starmetal Kukri. On top of that, you use Haunt as your cheap, fast spender to keep your damage and fetish buff up all the time. In addition, Haunt, being a spender, helps to trigger additional cooldown on things like Spirit Walk and Piranhado allowing you to nearly spam both. Pretty much I found my fetishes just destroying all the mobs really fast with their insane attack speed and I had Big Bad Voodoo up the entire time. I could also get 1-2 Piranhados up around me and get out of harms way through Spirit Walk. I’m sure if I can find a well rolled Hellfire Amulet, the addition of a passive like Fierce Loyalty will allow me to clear maps much faster when I’m out of combat. So I did mention a few ideas for variations. While the Obsidian ring is cool, it might be a bit of overkill because your Grave Injustice will probably be handling the majority of your cooldown reduction. It’s just that you will see come up even faster with all of these abilities working together. Alternatively, if you find yourself dying frequently, you could replace the Obsidian ring with a Unity. I think as long as you’re able to maintain all 23 fetishes, you should be in good shape. One thing I do on top of keeping my fetishes up is that I use Simplicity’s Strength for the health generation. Another idea I have is to use a Tall Man’s Finger with the Ukhapian Serpent mojo for your weapon passive. The main advantage of a build like this is having the big dog tank acting as a damage absorption unit. You could also using something like Leeching Beasts as a passive for more health regeneration. The only problem with this approach is that you’ll have to sacrifice an ability on your action bar. I’d pretty much would get rid of Piranhado in exchange for having a big dog, but I think this should be more for fun than anything else. You could try a Homoculous for auto-summoning your big dog but I feel that would be more appropriate for a sacrifice type of build. You really don’t want to diverge too much even though the idea might sound interesting. Gem-wise, I did mention Simplicity’s Strength for the 2% healing capability along with the damage increase to your generator (which probably will be Rain of Toads). In addition, you definitely want Enforcer for your pet damage increase and damage reduction for your pets as well as Gogok of Swiftness for more attack speed and cooldown reduction. Next I would like to push this build a bit. It’s an incredible build, very fun, fast pace and never boring. You’re very active but can sit back a bit while your pets hammer your foes. The addition of the Obsidian Ring of the Zodiac just makes this build over the top and speedy while the return of Tasker and Theo allows you to chew through monsters like butter.